One of the challenges of working with newcomer English language learners who have only basic English skills is keeping content on grade level. At the ENLACE Academy for newcomers at Lawrence High School in Massachusetts, teachers have found that the structures of Model United Nations offer a good way to get students discussing a grade-level topic with materials that support language acquisition. 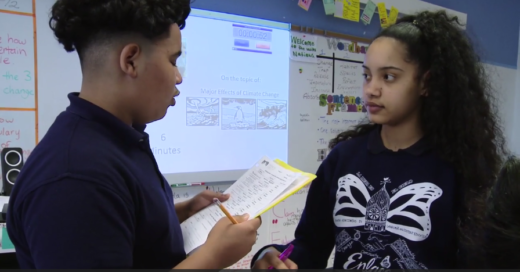 "We find it very important for our students to not just develop the reading and writing habits of English language learners, but also to really feel comfortable engaging in academic conversation," said Joe Burkett, a ninth-grade world studies teacher. "And Model UN presents a really structured way to enter into that." In this Teaching Channel video Burkett explains how he prepares the materials that support students, including sentence frames, vocabulary support, language structures and listening guides. He also highlights how his students are practicing making arguments with evidence in order to persuade groups that may not agree. Academic vocabulary support is especially important for newcomers who are not only learning English for the first time, but who also may have gaps in their learning. Burkett uses a "Seven Step Vocabulary model" for technical vocabulary words around climate change that his students may not know. "A lot of times, through the vocabulary, you can really have the students engage with some of the content you want them to focus on," Burkett said.